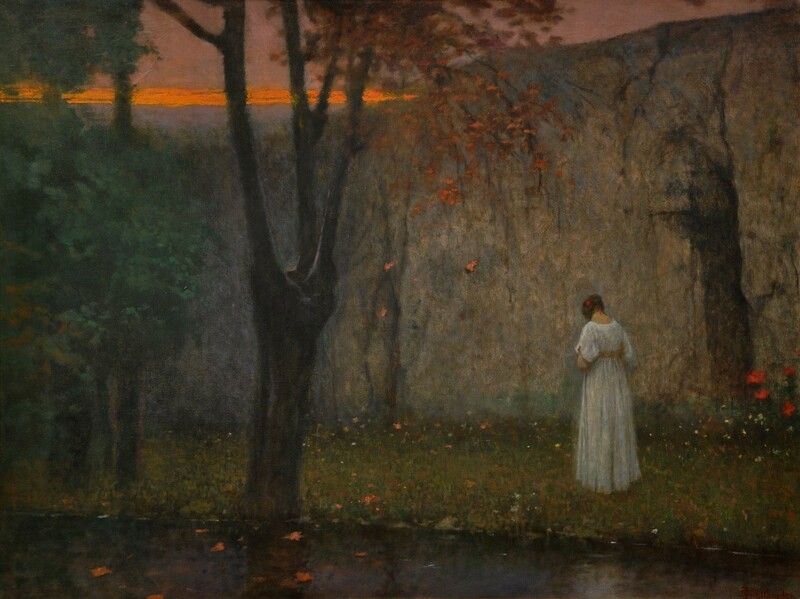 Jakub Schikaneder (1855–1924), Podzimní červánky (Autumn Red) (1910), media and dimensions not known, Muzeum umění Olomouc, Olomouc, The Czech Republic. Wikimedia Commons. 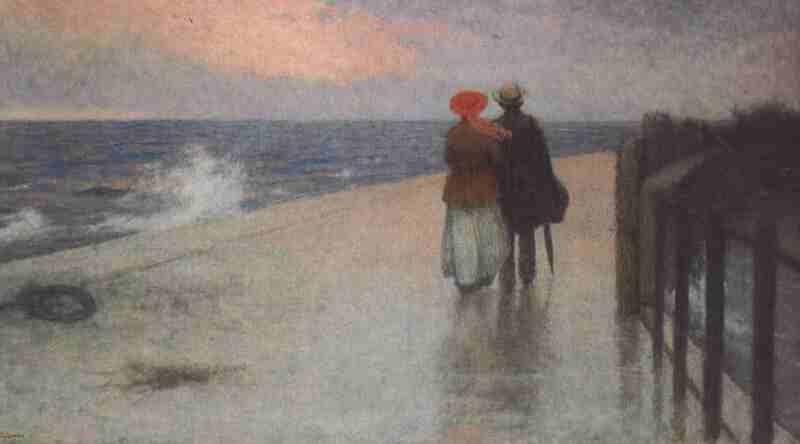 This article looks at the later half of the career and paintings of the Czech artist Jakub Schikaneder (1855–1924), the first article of which appeared yesterday. During his earlier years, he seems to have painted predominantly in oils, but after 1900 worked in pastels increasingly frequently. Schikaneder was involved in the exhibitions of the Prague School of Decorative Arts at the Paris World Fair in 1900, and that in St Louis, Missouri, four years later. He and his wife seem to have visited the coast of the Adriatic and Heligoland, a small archipelago in the eastern North Sea. Jakub Schikaneder (1855–1924), Evening Street (1906), media and dimensions not known, Národní galerie v Praze, Prague, The Czech Republic. Wikimedia Commons. 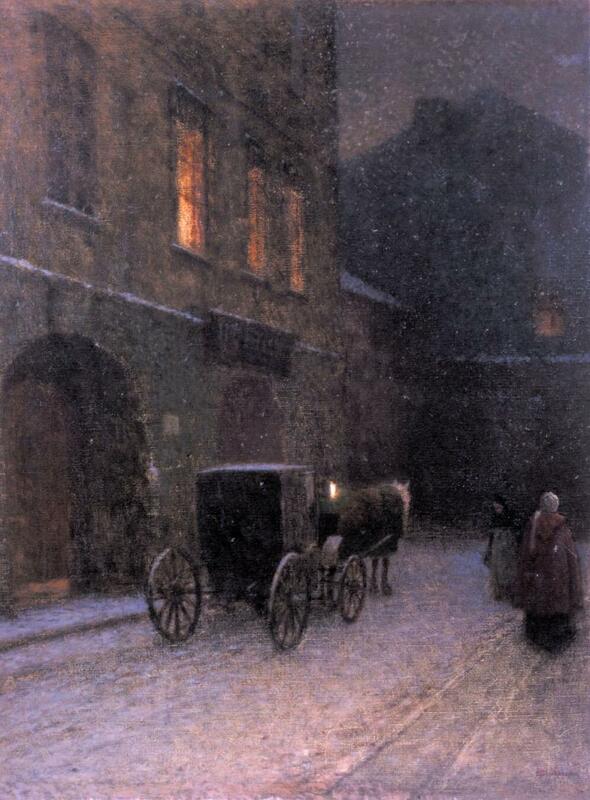 Schikaneder’s painting of Evening Street (1906), which I presume shows Prague in the winter, is also quite well-known, and is almost canonical in its completeness. Jakub Schikaneder (1855–1924), Večer v zahradě (Evening in the Garden) (1907-09), further details not known. Wikimedia Commons. Evening in the Garden (1907-09) is the first of a pair of paintings in which the same woman appears at dusk, wearing the same white dress, with her back to the viewer. Here she stands in an avenue of small trees which leads to the gate of a house. A full moon has already risen over the roof of the house. Although all appears quiet, there is a sorrow too, and the suspicion that things are not right – the unease conveyed so well in the much later paintings of Paul Delvaux (1897-1994). Jakub Schikaneder (1855–1924), Staro pražská zákoutí (Nooks of Old Prague) (1907-09), media and dimensions not known, Moravská galerie v Brně, Brno, The Czech Republic. Wikimedia Commons. Although I was unable to come up with a translation of the title of Staropražská zákoutí (1907-09), the title of this winter night-time street scene apparently means Nooks of Old Prague (thanks to Caspar for that). A carriage stands waiting outside the front of what may be a small hotel, as two women make their way past. Snow is falling. 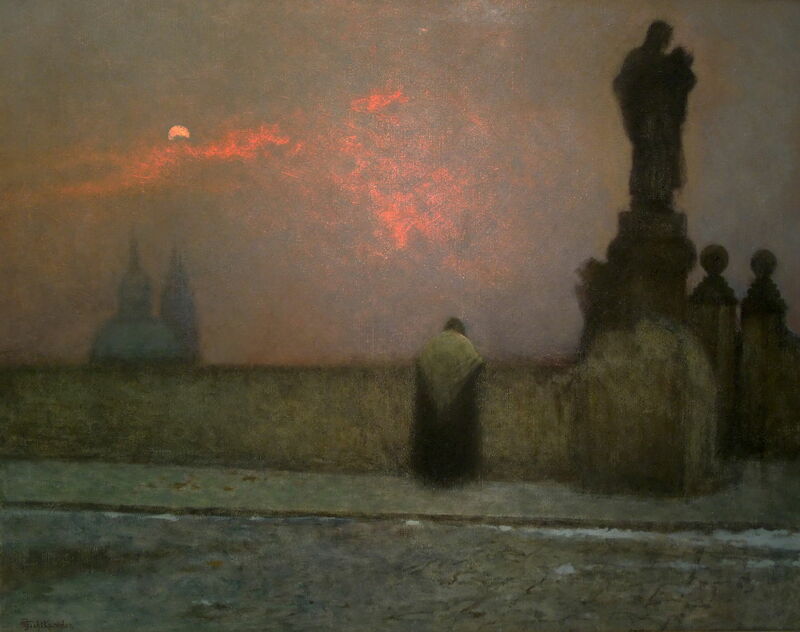 Jakub Schikaneder (1855–1924), Stmívání (Dimming) (1909), media and dimensions not known, Galerie umění Karlovy Vary, Karlovy Vary, The Czech Republic. Wikimedia Commons. 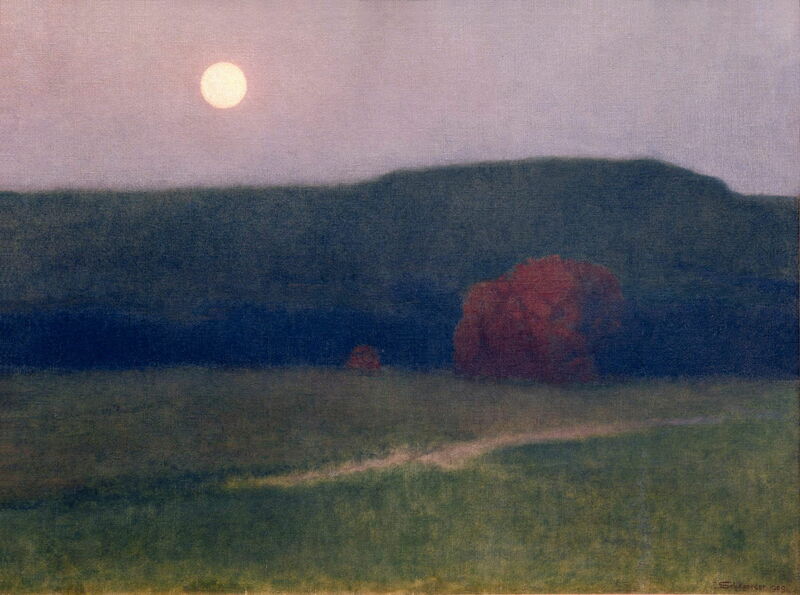 In Dimming (1909), Schikaneder takes this soft atmospheric approach out into the country, to capture dusk there, with the full moon hanging over a wooded ridge in the early autumn. Jakub Schikaneder (1855–1924), By the Girl’s Bed (1909-10), oil on canvas, 115 × 132 cm, Národní galerie v Praze, Prague, The Czech Republic. Image by Ophelia2, via Wikimedia Commons. By the Girl’s Bed (1909-10) is his interpretation of the theme of childhood illness. 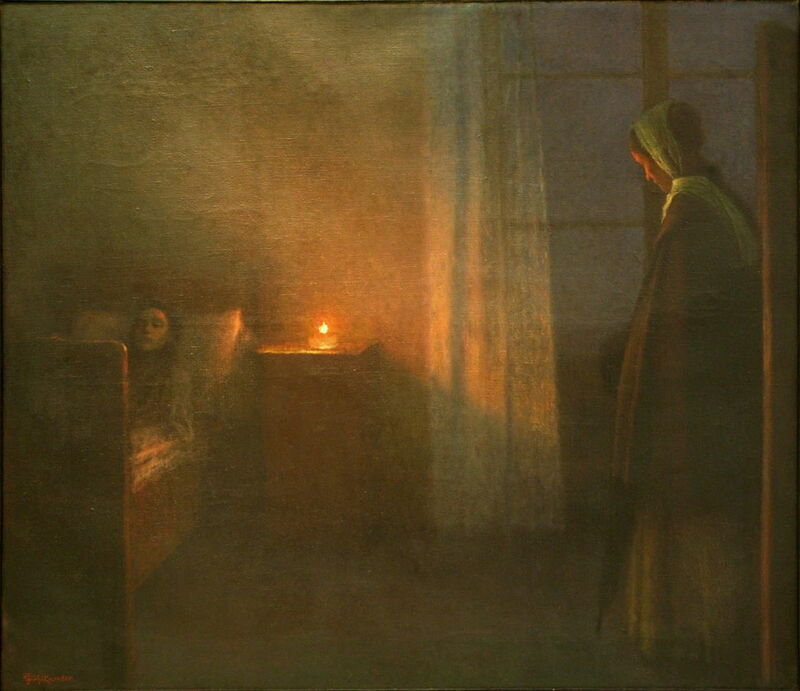 As with Christian Krohg, in this case the girl may be chronically ill with tuberculosis, and her mother has come up to check on her as she sleeps by a nightlight. The girl’s bed is arranged so that her body rests almost upright, a characteristic of those with chronic chest complaints such as tuberculosis. 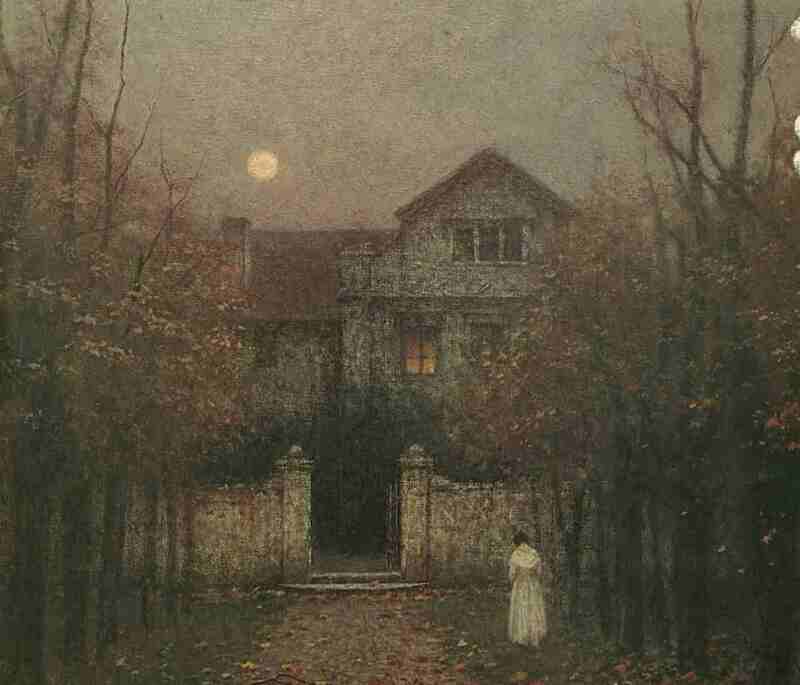 Autumn Red (1910) returns to the lonely figure seen in Evening in the Garden above. She appears again at dusk, with a fiery orange slash through the sky. It is autumn, with the leaves starting to turn copper-brown and falling onto the water behind her. She stands on a narrow grassy strip between that water and a high wall, which still bears the marks of old climbers. Dotted around her are small white and large red flowers. 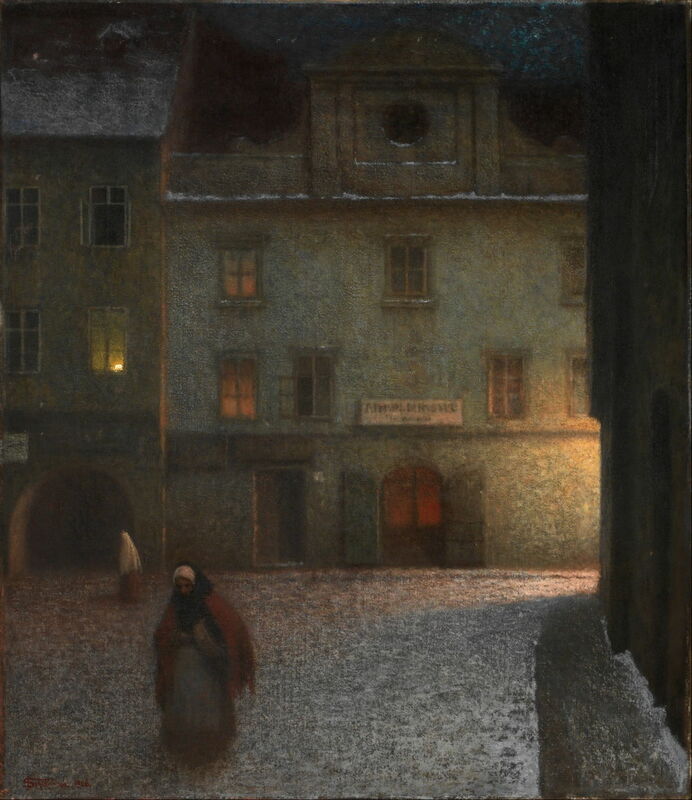 Jakub Schikaneder (1855–1924), V podvečer na Hradčanech (In the evening on Hradčany) (1909-13), oil, 86.5 x 107.5 cm, Národní galerie v Praze, Prague, The Czech Republic. Wikimedia Commons. In the evening in Hradčany (1909-13) shows a spectacular winter dusk in this district of the city of Prague. In the distance are the twin spires and tower of St Vitus’ Cathedral, suggesting this view is on the Čechův Bridge over the Vitava River. A lone woman leans over the wall of the bridge, looking down at the river below. Is she contemplating jumping? After 1910, Schikaneder became more withdrawn, although he continued to teach until after the First World War. Jakub Schikaneder (1855–1924), Na svatební cestě (On Honeymoon) (1919-20), further details not known. Wikimedia Commons. On Honeymoon (1919-20) shows a couple, again with their backs to the viewer, walking along a promenade by the sea. Schikaneder may have painted this in Heligoland. Jakub Schikaneder (1855–1924), Molo (The Mole) (1922-23), further details not known. Wikimedia Commons. 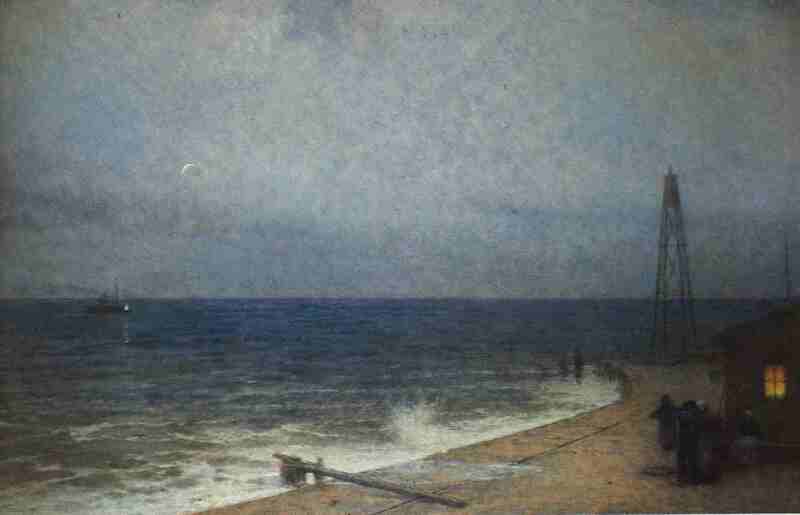 Schikaneder’s The Mole (1922-23) may also have been painted when he was on holiday in Heligoland. It shows a small fishing wharf by the sea, in the calm of an evening. As a fishing boat approaches from the left, a group of four people ready themselves outside a hut at the right. They may be waiting to land the catch, and two of them are women wearing white caps. 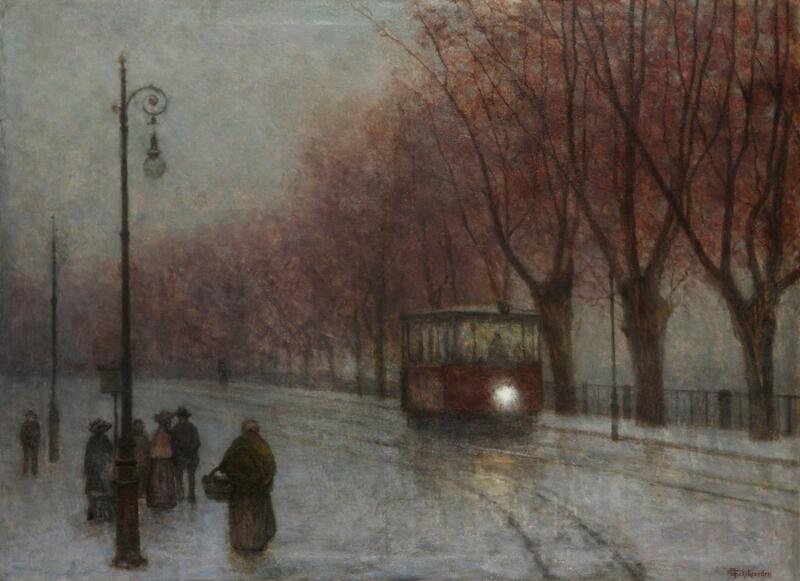 Schikaneder’s undated Riverbank with Tram shows a tram travelling, most probably in Prague, during a damp and foggy autumn evening. Jakub Schikaneder (1855–1924) (attr), Dark Path (date not known), oil on panel, 22 × 32.5 cm, Private collection. Wikimedia Commons. 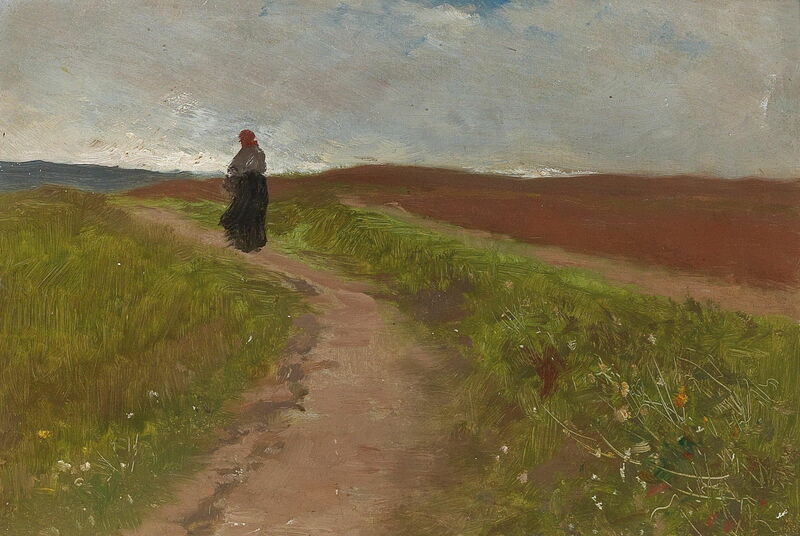 Dark Path is an undated oil sketch which has been attributed to Schikaneder. He might have painted this during his early career. Jakub Schikaneder (1855–1924), The Last Journey (date not known), further details not known. The Athenaeum. Like many artists of this period, Schikaneder displayed a somewhat irreverent attitude to death, as shown in his undated The Last Journey. 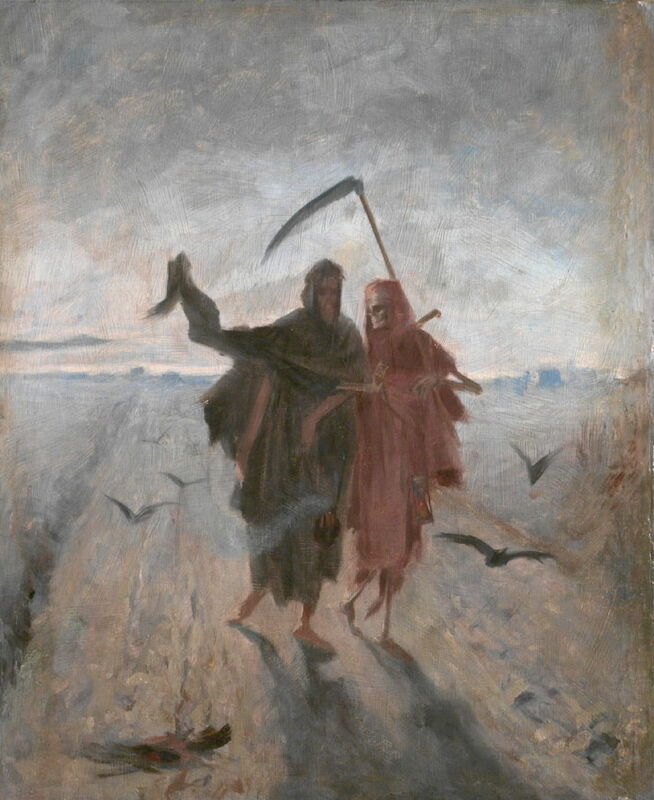 The Grim Reaper (death) clad in red here accompanies a new recruit to the underworld or afterlife, as they walk together surrounded by large black crows. One of the birds appears to have met its own bloody end just in front of them. Schikaneder died in Prague in 1924. Posted in General, Life, Painting and tagged Delvaux, Krohg, naturalism, painting, realism, Schikaneder, symbolism. Bookmark the permalink. You are very welcome to reblog or to link to it. Thank you for your kind invitation, but writing for this blog takes enough of my time already! Thank you again – I have corrected the caption and text.